Before a school existed in Eagle Lake, African Americans were educated at home or in small churches, with some classes held in a local blacksmith shop. The first school for African-American children was located on Main Street in a room on the first floor of the old United Brotherhood of Friendship Hall. The School was later relocated to C Street. In the late 1920s, a visionary young professor, Eugene H. Henry (b. 1896), came to Eagle Lake to teach. Born in Flatonia, Henry was educated at Prairie View State Normal and Industiral College, received a scholarship to Howard University and served in the U. S. Army during World War I. Henry, along with others, saw the need for an African-American School in Eagle Lake. 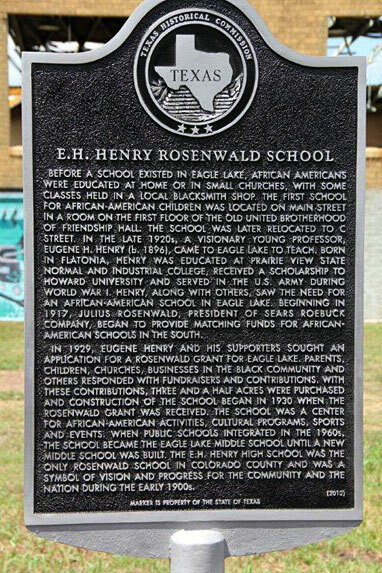 Beginning in 1917, Julius Rosenwald, president of Sears Roebuck Company, began to provide matching funds for African-American schools in the south.